（C）2010 Fox and its related entities. All Rights Reserved. 本映画『 ファンタスティック Mr.FOX　(2009) FANTASTIC MR. FOX 』のネタバレSPOILER： Wes Anderson and Noah Baumbach worked on the screenplay at Gipsy House which was Roald Dahl's estate. They added a new beginning and ending, adapting the latter part of the story (the war scenario) as the main plot. Unsatified with the book's ending, they found that the author's original manuscript contained a different ending, with sketches, taking place in a supermarket. Anderson later said, "That was awfully lucky, because we needed a new ending". 本映画『 ファンタスティック Mr.FOX　(2009) FANTASTIC MR. FOX 』のネタバレSPOILER： When everyone toasts with juice boxes in the supermarket at the end of the film, Ash is the only one holding a grape juice box, as opposed to the others' apple juice boxes. 本映画『 ファンタスティック Mr.FOX　(2009) FANTASTIC MR. FOX 』のネタバレSPOILER： The scene in which Rat and Mr. Fox fight to the death originally included Rat making reference to his wristwatch, stating, "I've still got the watch . . . She never asked for it back," referring to Mrs. Fox. The dialogue was inspired by an actual onstage aside from Keith Richards to Eric Clapton at a rehearsal of a concert staged by Sheryl Crow, which was witnessed by Wes Anderson. However, the scene was ultimately changed for the final film. 本映画『 ファンタスティック Mr.FOX　(2009) FANTASTIC MR. FOX 』のネタバレSPOILER： At one point in the film, Mrs. Fox tells Ash that he has "29 minutes to come up with a proper apology" for Kristofferson. In terms of the film's run time, his apology actually occurs approximately 39 minutes later. 【ファンタスティック Mr.FOX 第01段落】　While raiding a squab farm, Mr. Fox (George Clooney) and his wife Felicity (Meryl Streep) trigger a fox trap and become caged. Felicity reveals to Fox that she is pregnant and pleads with him to find a safer job should they escape. 【ファンタスティック Mr.FOX 第02段落】　Two years later, the Foxes and their sullen son Ash (Jason Schwartzman), are living in a hole. 【ファンタスティック Mr.FOX 第03段落】　Fox, now a newspaper columnist, moves the family into a better home in the base of a tree, ignoring the warnings of his lawyer Badger (Bill Murray). The tree is located very close to facilities run by farmers Walter Boggis (Robin Hurlstone), Nathan Bunce (Hugo Guinness), and Franklin Bean (Michael Gambon). 【ファンタスティック Mr.FOX 第04段落】　Soon after the Foxes move in, Felicity's nephew Kristofferson (Eric Chase Anderson) comes to live with them, as his father has become very ill.
【ファンタスティック Mr.FOX 第05段落】　Ash finds this situation intolerable; his soft-spoken cousin is apparently superior to him and everyone, including his father, is charmed by Kristofferson at Ash's expense. 【ファンタスティック Mr.FOX 第06段落】　Fox and the opossum building superintendent, Kylie (Wallace Wolodarsky), steal produce and poultry from the three farms. 【ファンタスティック Mr.FOX 第07段落】　The farmers decide to kill Fox and camp out near the family's tree. 【ファンタスティック Mr.FOX 第08段落】　When he emerges the farmers open fire but only manage to shoot off his tail. They then attempt to dig Fox out. 【ファンタスティック Mr.FOX 第09段落】　After demolishing the site of the tree, the farmers discover the Foxes have dug an escape tunnel. 【ファンタスティック Mr.FOX 第10段落】　Reasoning that the Foxes will have to surface for food and water, the farmers lie in wait at the tunnel mouth. 【ファンタスティック Mr.FOX 第11段落】　Underground, Fox encounters Badger and many other local animal residents whose homes have also been destroyed. 【ファンタスティック Mr.FOX 第12段落】　As the animals begin fearing starvation, Fox leads a digging expedition to the three farms, robbing them clean. 【ファンタスティック Mr.FOX 第13段落】　While the other animals feast, Ash and Kristofferson, beginning to reconcile after Kristofferson defended Ash from a bully, return to Bean's farm, intending to reclaim Fox's tail. 【ファンタスティック Mr.FOX 第14段落】　When they are interrupted by the arrival of Bean's wife, Ash escapes but Kristofferson is captured. 【ファンタスティック Mr.FOX 第15段落】　Discovering that Fox has stolen their produce, the farmers flood the animals' tunnel network with cider. 【ファンタスティック Mr.FOX 第16段落】　The animals are forced into the sewers, and Fox learns that the farmers plan to use Kristofferson to lure him into an ambush. 【ファンタスティック Mr.FOX 第17段落】　The animals are confronted by Rat (Willem Dafoe), Bean's security guard. After a struggle with Fox leaves him mortally wounded, Rat divulges Kristofferson's location. 【ファンタスティック Mr.FOX 第18段落】　Fox asks the farmers for a meeting in town near the sewer hub; he will surrender in exchange for Kristofferson's freedom. The farmers set up an ambush, but Fox and the others anticipate it and launch a counterattack. 【ファンタスティック Mr.FOX 第19段落】　Fox, Ash and Kylie slip into Bean’s farm. A much-matured Ash frees Kristofferson and braves enemy fire to release a rabid beagle to keep the farmers at bay. 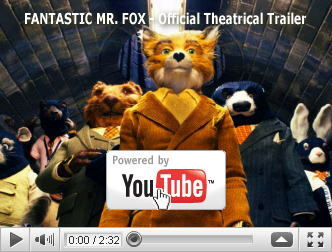 【ファンタスティック Mr.FOX 第20段落】　The animals become accustomed to living in the sewers with others considering moving in. Ash and Kristofferson settle their differences and become good friends. Fox leads his family to a drain opening built into the floor of a supermarket owned by the three farmers. 【ファンタスティック Mr.FOX 第21段落】　Celebrating their new food source and the news that Felicity is pregnant again, the animals dance in the aisles. スコット・ピルグリム VS. 邪悪な元カレ軍団 (2010) ?